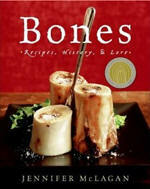 In 2006 I acquired the book Bones by Australian chef de cuisine Jennifer McLagan. The front cover has a splendid picture of roasted marrow bones. This led to my browsing through the editions of medieval cook books on my bookshelves to see whether anything interesting was done with marrow in those days. By the way, the second edition of this book has a much less spectacular cover illustraton, which is a pity. But indeed, bone marrow was used a lot. Mostly the marrow went into sauces and pasties, in the same way as butter or suet, or occasionally served as marrow porridge. Two recipes in particular caught my fancy: ‘sluberkens’, small pasties stuffed with marrow and sugar, and the many dishes combining marrow and quinces (here is a recipe for stuffed quinces with marrow). 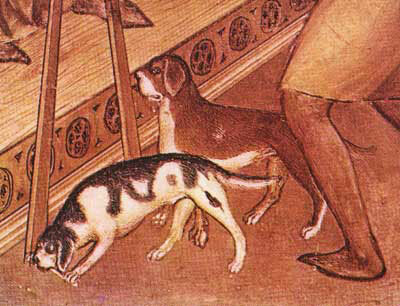 And as you can see on the picture, marrow bones were also given to the dogs in the Middle Ages (detail from the fresco The Wedding in Canaa (1376-1378) by the Italian painter Giusto de’ Menabuoi in the baptistery of the cathedral in Padua. 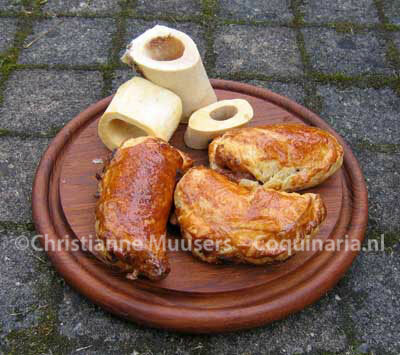 In the Netherlands there is a sweet cake called mergpijpje (marrow bone). In English this is called a punsch-roll, and it has green marzipan instead of white. Where the Dutch got their inspiration for the name is clear. But what is a real marrow bone? Marrow is the fatty tissue within hollow bones. 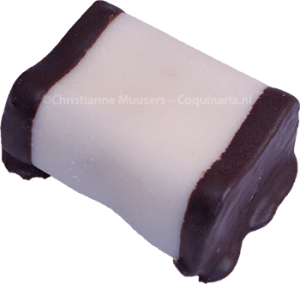 Nowadays it is not very popular, but it used to be regarded as a real treat. The best marrow bones are the shinbones of cattle (beef, veal, but also pork and sheep although the first two are the most popular). The bone marrow is rich in iron, phosphorus and vitamin A. Shinbones or shanks are rare in modern recipes, except in stock and the Italian dish ossobucco. 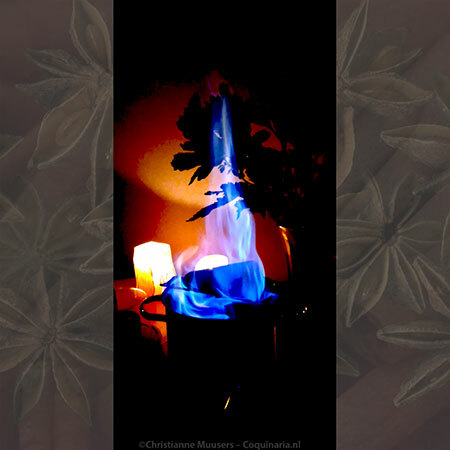 Often the marrow is not even consumed, but put aside and thrown away with disgust. Different from what you might expect, marrow fat is very healthy. It contains a large percentage of monounsaturated fat that may lower cholestor levels. Regularly consuming food with marrow fat could even diminish the risk of heart attacks! But this has yet to be proved conclusively. Before using bone marrow, you have to prepare the marrow bones. The bones have to soak for at least twelve hours in salted water which has to be refreshed several times. You’ll see the water turn pink from the blood that is extracted from the bone marrow by the salted water. After soaking rinse the bones and dep them dry. Bone marrow can be prepared in two fashions: you can boil them or roast them. If you boil them, fifteen minutes is enough. Roasting takes about as much (or little) time, in a preheated oven of 225-240 °C/435-465 °F. Just place the bones upright on a greased baking tray. When the bones are done, they are served on a plate with a special marrow spoon. The marrow is scooped out of the bones, spread on freshly toasted bread and sprinkled with salt. Marrow was not only popular food in the Middle Ages. In the seventeenth and eighteenth centuries the serving manner was as described above (and see the cover of the book Bones on the right). The marrow spoon also dates from this era (see below). 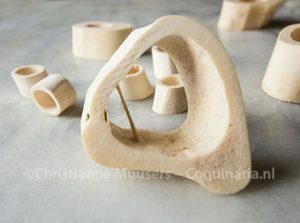 It is a pity that nowadays marrow bones are mainly considered treats or toys for dogs. ‘Sluberkens’ or ‘Slupers’ were a delicacy. The meaning of the name of the dish is not clear. According to the Middelnederlandsch Woordenboek (The Lexicon of Middle Dutch) a ‘sluper’ is related to the Flemish ‘sluymer’, which according to the Dutch-latin lexicon of Kiliaen from 1575 means “artocreae sive lagani delicatioris genus”, in English “meat pasties or pancakes of a delicate nature”. Recipes for these marrow pasties are present in three of the six Middle Dutch cook books: in ms UB Gent 476 (that is the recipe presented on this page, edition Jansen-Sieben and Van Winter recipe nr 41), the Notabel boecxken van Cokeryen (edition Jansen-Sieben and Van der Molen-Willebrands recipe nr 155, same recipe but without egg yolks), and the Nieywen Cooc boeck of Gheeraert Vorsselman (edition Cockx-Indestege recipes XI.12 and XIV.10, this recipes use cooked eggs instead of raw egg yolks). Marrow pasties are not exclusively Dutch, you can also find recipes in for example the fourteenth century English Forme of Cury where they are called ‘pety peruaunt’ (edition Hieatt and Butler recipe nr 203), and the French Ménagier de Paris, also from the fourteenth century (“Buignets de mouelle”, edition Brereton and Ferrier recipe nr 224). 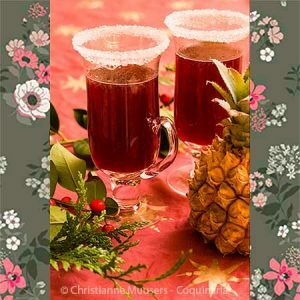 According to the Notabel boecxken van cokeryen (see below) the sluberkens were meant as a starter (“Ende dan dient mense metten eersten gerechte” – “And then one serves them forth with the first course”). See for complete title descriptions the bibliography at the bottom of this page. To make this one must chop marrow. Add cinnamon, sugar and currants and mix this together with the marrow. Then also add two or three yolks of raw eggs to the marrow and stir it together. Then have dough and put [the stuffing] in that. Make [the pasties] the size of apple pasties and then bake them in an oven. Then they are served and eaten hot. The name ‘sluberkens’ is quite to the point. These pasties are so good you just slurp the stuffing out of them! They are easy to make, and don’t need a lot of time either. According to Thomas vander Noot the pasties are to be served in the first course. To be historically correct, you should do that too. But nobody is going to write you a fine if you serve them as dessert. For four to six pasties as first course or dessert; preparation in advance several hours to steep the marrow bones, and 15 minutes; preparation 40 minutes. Soak the marrow bones for at least twelve hours in water with salt. Refresh the water several times. Rinse the bones, cook them for ten to fifteen minutes. Let cool for a few minutes, then push or scoop the marrow out of the bones. Preheat the oven to 200 °C/390 °F. Chop the warm marrow (it will get hard again when it has colled to room temperature). Mix in sugar, currants, cinnamon, sugar and egg yolks. Sprinkle some flour on the worktop. Roll out the short crust, cut for to six rounds out of it (diameter five to six inches). Place a tablespoon full of stuffing on one half of each round, fold them and press the edges firmly together. Coat the pasties with raw egg yolk. Bake them in the oven for about twenty minutes. The pasties are to be eaten while still hot. These are dried grapes. There are several kinds of raisins, depending on the kind of grape that was used. Sultana’s are NOT raisins a special brand, but the dried berries from the sulatana grape. Currants are original the dried grapes of a grape variety with small berries that was grown in Corinth (Greece). There are more varieties used for raisins, like the Seedless Thompson. See also Raisins. The marrow spoon dates from around 1700, when serving marrow bones was quite popular. The spoon could be used at both ends, depending on the width of the marrow bone. The nineteenth-century British Queen Victoria had an unladylike fondness of marrow on warm toast. W.L. Braekman, “Een belangrijke middelnederlandse bron voor Vorselmans’ Nyeuwen Coock Boeck (1560)” (An important Middle-dutch source for Vorselman’s New Cookbook’) . In: Volkskunde 87 (1986) pp. 1-24 (the first volume of KANTL Gent 15). on this site there is an edition in progress of this manuscript, with translations in modern Dutch and English. Kiliaen – Cornelis van Kiel (ca 1530-1607) wrote the first Dutch dictionary, the Dictionarium Teutonico-Latinum (1574). Kiliaen uses not only Latin, but also German and French to explain the meaning of Dutch words.